Setsubun Mame-maki and Hoshimatsuri, the traditional Japanese rite of the new spring (Risshun), will be observed on Sunday, Feb. 3, starting from 1:30 p.m. at Koyasan Buddhist Temple in Little Tokyo. An oni (devil) holding an iron bar is part of the ceremony. According to the lunar calendar, this annual ritual denotes the initiation of the new year and the beginning of spring, a time when one wards off misled karma and brings good fortune for the year through the esoteric celebration Hoshi-matsuri (Star Festival), which is for deifying one’s own star and praying for its fate. This will be preceded by a fire ritual (Goma) in which misfortune of the past year is exorcised and expelled according to the Shingon esoteric Buddhist tradition. As one of the traditional exorcism rites, the Mame-maki (tossing roasted soybeans) will be performed, following the Goma ritual, by the Fuku-Otoko (lucky man) and Fuku-Onna (lucky woman) in traditional costume. This is done while shouting “Oni wa soto” (out with the devil) and “Fuku wa chi” (in with good luck) repeatedly. Bishop Emeritus Taisen Miyata of the temple will conduct the service for the new spring in the Year of the Snake (Mi-doshi). Emily Folick, the Nisei Week Queen for 2012-2013, will be Fuku-Onna and Kosuke Nagashima, former chief editor of The Rafu Shimpo, has been selected as Fuku-Otoko for this year. The two will toss roasted beans in the traditional manner. 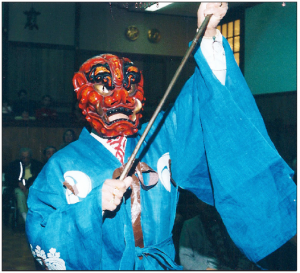 The oni appears with a mask and costume holding an iron bar during the ceremony. More than 300 people are expected to attend the rite. For information regarding the prayer, ofuda (charms) and omamori (amulets), visit the temple office at 342 E. First St., Los Angeles, or phone (213) 624-1267.